I recently came into possession of a Very Large Squash (one of the zucchetta rampicante or tromboncino tribe, which get enormous but stay tender) and naturally decided that I was going to make ridiculous amounts of zucchini bread and freeze most of it. It wasn’t until I’d filled up my largest mixing bowl with the quadrupled dry ingredients that I realized I still had to add a bunch more stuff and there wasn’t room. Preheat the oven to 350F. Butter a 9×5-inch loaf pan. Combine all the dry ingredients. Beat the eggs and mix with the butter and milk. Add to the dry ingredients along with the zucchini and the nuts. Mix quickly with a folding motion; do not beat and stop as soon as the dry ingredients are all moistened. Pour into the prepared loaf pan; bake about an hour, or until a toothpick inserted into the loaf comes out dry. Cool on a rack for 10 minutes before removing from the pan. Another thing I like to do with zucchini is make “noodles” out of it, as shown here. If you don’t have the handy julienne peeler, you can tediously cut the noodles by hand, or use a food processor. I have a old Cusinart with a julienne blade that produced strips of decent length if I didn’t use the skinny food tube insert but rather put the squash pieces sideways directly onto the cutting blade inside the broader plastic tube, if that makes any sense at all (darn, should have snapped a photo. The theme of my life). I think I need a julienne peeler, though. Look at all the colors! Some of these are Bull’s Blood and the others are from a mix. Without really meaning to, I grew white beets for the first time; they taste… like beets, but like the golden ones they don’t stain everything they come in contact with, which can be useful. These all got mixed together, though. Trim and peel the beets, then grate them (food processor or by hand). Preheat a large skillet (non-stick or be prepared to grease it well) over medium heat. Toss the grated beets with the rosemary and salt, then add the flour and egg gradually while mixing thoroughly. Melt the butter in the skillet. Plop big spoonfuls of the beet mixture into the pan, flatten, and cook over medium-high heat until the bottom of the cakes is crisp and holds together, then flip and cook until the second side is browned. You may have to add extra butter or oil for a second batch of cakes. I’m looking forward to planting more beets for fall! I’ve frozen a lot of steamed beet greens, too (or eaten them fresh). A very good Year of Root Vegetables harvest. Have you ever tried roasting beets in the oven? Wrap them in foil and roast at 375 degrees until done. Medium size beets take from 30 to 45 minutes depending on size. Slice, drizzle with a good balsamic vinegar and crumble a little feta on them. In my opinion, roasted beets turn out sweeter that boiled beets, as a result taste better. I love roasted beets. Today, just a bit more convenient (and cooler!) to boil them. Also, some of them were really small. 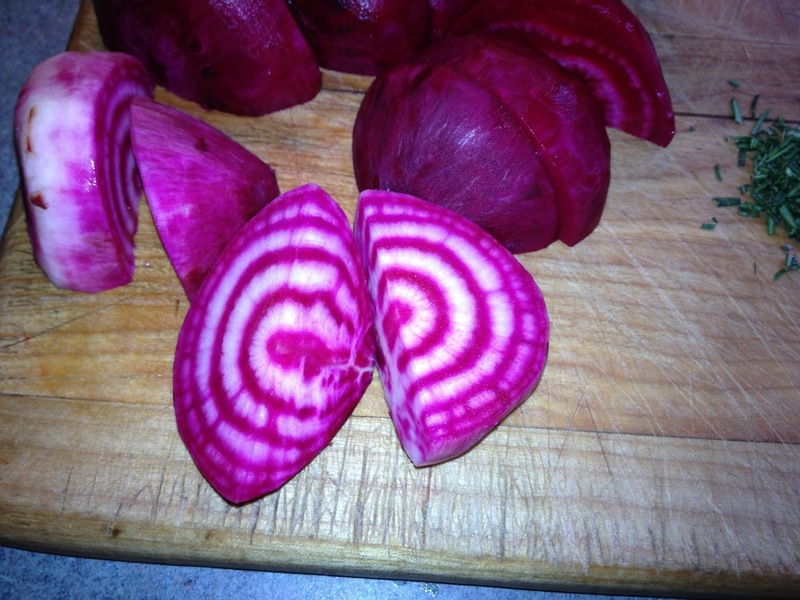 The beets in your photo look peeled. 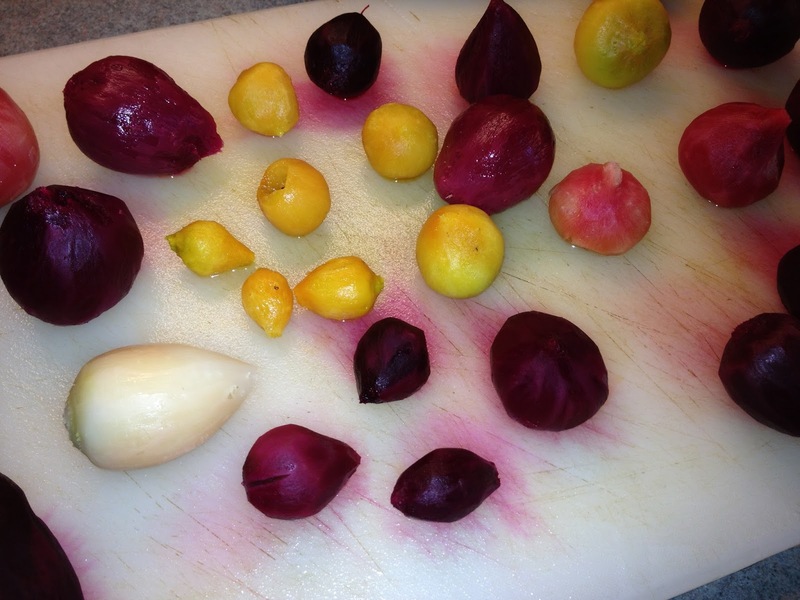 Did you peel the beets before cooking or after? A friend of mine made waffles with Bitman's beet pancake recipe. I must have been good because her 18 month old daughter inhaled them! The beets in both photos are peeled. The first set (the beets destined for salad) were peeled after cooking; the second set were peeled before, which I'd only ever do in cases like this where they have to be grated. I saved the larger beets for that purpose because it's a little easier to hold onto them while you scrape.